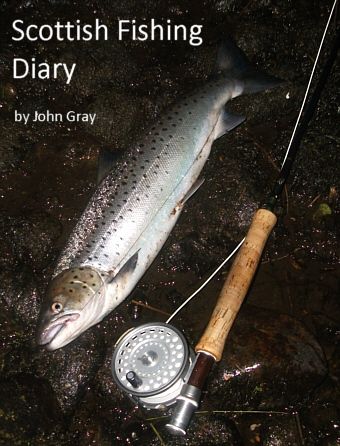 This is a fishing diary of days and nights spent chasing trout, salmon and sea trout on rivers and lochs throughout Scotland. 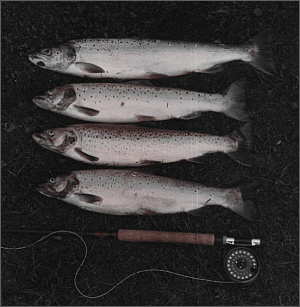 From the mid nineteen eighties, I kept a fairly regular, if simple, fishing diary, or log, recording my fishing experiences, mainly of fly fishing for trout, salmon and, in particular, sea trout. My main interest has always been in river night fishing for sea trout, through the short summer nights - fishing in the dark, so to speak, sometimes very much so! Almost all my fishing has been done on club and association waters, for which membership and permits are generally available. In the hope that visitors to this website might find some interest in my fishing exploits, I will transcribe the contents of my diaries here beginning in the year 1985. The entries for each year will be archived and accessible from the links above. 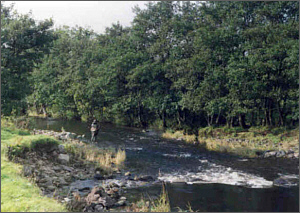 I first fished the River Endrick for sea trout in 1983, my first outing on the river being recorded in the article entitled Endrick Sea Trout. Having had a taste of what this little Loch Lomond tributary could offer, I joined the Loch Lomond Angling Improvement Association the following year. This gave me access to several miles of fishing on the River Leven, the whole of Loch Lomond and, most importantly, to the larger part of the River Endrick, with its potentially fabulous sea trout fishing. I had fished the Association water on the Endrick for a season when I determined to keep a diary of my fishing. The early entries were rather sketchy and, at times, incomplete but, as the habit became established, so the detail became more comprehensive. I kept the dairy at the shop and it soon became a routine matter to enter the details of the previous day's or night's fishing while events were fresh in my mind, between bouts of nodding off to sleep having got to bed at 5 or 6 am after a long night session on the Dam! 1984, my first year as an association member, was more exploratory than productive. I sought the solitude of the less popular pools, in the vain expectation of success. Only later, after becoming better acquainted with the river, did I realise that there were very few pools which were consistently productive. Consequently, in my first year, despite many nocturnal hours by the river, there was little to record. I tried a variety of pools in the many miles of fishing between Fintry and Gartness and had very limited success. Indeed, catches were registered from only three pools. The Wheel, where I fished most often, yielded three fish, the Cement Wall at Gartness, two and Coolies Lynn, one. All fish were in the two to three pound range and all were taken, at night, during the months of August and September, on fly and maggot fished on a floating line. I had merely scratched the surface. 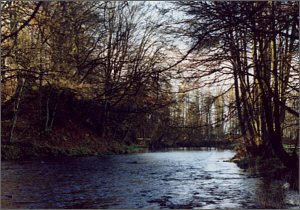 During 1985, my second year as an Association member, I continued to explore the river, not in any really constructive or organised way, finding new pools, where the odd fish might be caught on favourable nights. I was intent on exploring the river on my own, seeking out the quieter, less popular pools and avoiding the busier pools, clearly marked by a number of cars parked by the roadside on favourable nights. But the less popular pools on association water are less popular for a good reason.... they are generally less productive. I did catch a few fish but my success was modest in comparison to what might be achieved on the best night pools, and I had many a blank night. Trial and error, however, along with information gained from customers and riverside conversation with fellow association members, eventually focussed my attention on the better known pools, such as Netherton, Coolies Lynn, The Oak Tree, The Meetings Lynn and Drumtian. My diary shows that, in early July, I had two sea trout of 1 1/4 lbs each at Netherton, taken just after dark on a floating line with the river above summer level but dropping. The successful pattern was a Mallard and Claret, size eight, with two or three maggots on the bend of the hook. I should say at this point that the night fishing on the Endrick was mainly done with maggots attached to the fly. The main reason for this was that the main sea trout pools, at summer level, had very little flow. Much of the fishing was done on very slow, almost dead, water, where it was difficult to give life to a fly. I gave the conventional fly, without maggots, a fair go. I even heard of fishers having some success with it but I cannot recall, in ten years of fishing on the Endrick, having caught a sea trout in the hours of darkness with a bare fly. Water falling and clearing nicely after a small summer spate. Probably now at an ideal height for fly but I had chosen to spin, which was permitted below Ballochruin Bridge. After fishing down from the wooden bridge at Drumtian with no result, I found one or two sea trout in the Red Braes pool willing to follow my spinner. Unconvinced, they turned away at the last moment. Encouraged, I continued down the pool and, in the tail, just as the spoon left the far bank, I had a solid take. After an anxious few minutes, I dragged the fish, rather unceremoniously, on to the sandy bank. Four and a half pounds. My first grilse. Encouraged by my success with the spinning rod, I soon returned to Drumtian. The water was fairly high and coloured ( for night fishing) when I arrived at 11 pm but was falling and clearing. Fishing a small Sweeney Todd with a few maggots, I hooked, and succeeded in landing, a sea trout of three pounds near my own bank in two feet of water. In the tail of the pool above the Oak Tree, just below where the burn runs in on the far bank, fishing a Mallard and Claret with maggots and a neutral line, a Masterline DT7, I hooked the only fish of the night, a nice wee fish of 1 1/2 pounds. A sunny Saturday morning with the sun shining directly downstream. River fairly high after rain. I was alone, fishing two flies, a size eight low water Curry's shrimp and a Silver Blue, on a neutral line on a Sharpes 9.5 foot cane rod. I had already lost one fish and had an offer from another, just where the pool widens below the burn. Below me, a running fish showed twice on its way up the pool. I timed my cast to intercept it, just as the sun disappeared behind a cloud. To my surprise, it took me. After a strong fight on the light rod, I managed to net a lovely sea trout of 5 lbs 6 ozs. River low and clear but still dropping. Fish showing in the pool. Also busy with fishers. At 11 pm, I caught my only sea trout of the night, immediately above the overhanging tree, on my own version of a Dark Mackerel, with maggots. A 5 lb was fish taken near the tail by dubious method. River clear and fairly low. Very dark, cloudy, windy with rain threatening. By 12.15 am, all other fishers had gone, nothing caught. Just then, using a Dark Mackerel, I hooked the only sea trout of the night, although I did catch two brown trout of 1 lb and half a pound. More and more often though, as the season progressed, the name "Cowden Mill Dam" would crop up. The dam, as it was referred to, had been built by association members in the nineteen sixties, creating a holding pool of around a hundred yards in length and twenty yards wide, with a maximum depth of perhaps ten feet at the lower end near the dam. Enclosed by trees on both sides, it provided sanctuary for the shoals of large sea trout which, every year, made their way up from Loch Lomond. But it was not until the late summer of 1985 that I was to fish "the Dam" for the first time. Prior to 1985, although the association had access to both banks, it was only ever fished from the left bank. Throughout the short season, often not properly underway until August, the regulars would assemble at the damside and while away the time in fishing talk until the fall of darkness. One by one, in order of arrival, they would then wade slowly and quietly down the edge of the pool, pausing only to unhook a fish. Fantastic catches were made in those days, through the sixties, seventies and even into the eighties, though with less regularity than in the old days. 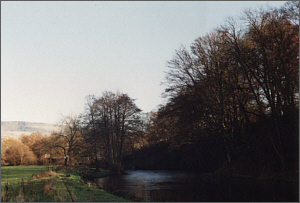 In September 1985, due to a disagreement between the Association and the riparian owner, we lost the Claylands fishing, comprising the left bank of the Dam along with about two miles of good water immediately downstream. A heavy blow, which would result in the loss of many members, prompt a re-examination of the running of the association and ultimately rock its very foundations. To allow new access to the Dam, the trees on the right bank were immediately cleared and fishing continued more or less as before. The clearing of the trees seemed to have little effect on the fish and, fortunately, the new owners of the lease on the left bank rarely fished at night. They did, however, fish during the day in high water and, unlike the association members, did not restrict themselves to fly fishing. Understandably, this led to some ill feeling and tempers would flare from time to time. That September was fantastic. I would fish usually four nights a week, sometimes arriving early to avoid the inevitable queue of fishers, or perhaps arriving at 11 or 12, by which time the queue had hopefully diminished. Either way, I would fish for at least five hours. One "run" down the pool would take 2 to 3 hours, fishing the fly and maggot as slowly as possible down the length of the pool. The dam was fishable on most nights, the exception being when it was high and coloured after a late summer spate. If the river was highish, but clear with a fairly good flow, I would fish the sink tip, two size eight flies with perhaps 6 to 8 maggots. In low water, it might be necessary to fish a single size 10 fly on a short leader with only two or three maggots, to avoid snagging on the riverbed. I caught my share of fish. One Monday morning, i.e. 12 midnight till dawn, using a sink tip line and long shank size eight flies loaded with maggots, I caught seven sea trout for 26 lbs. The following night the river had dropped back to normal level and I had nine sea trout for 27 lbs on the floating line..... needless to say, my best two consecutive nights ever! But there were many other good, though less spectacular, nights and I finished that season with 49 sea trout, a total which I have since been unable to equal.